LP leaders formally open the exhibit. A highlight of the 60th anniversary celebrations of the Liberal Party of the Philippines (LP) is a photo exhibit chronicling the history of the party from its birth in 1946 until the present. 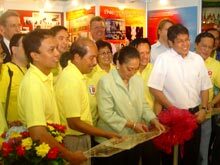 The LP’s 60th Anniversary Committee, of which the Friedrich Naumann Foundation is a member, formally opened the exhibit on 20 January, 2006 in Ali Mall, Cubao, Quezon City. The exhibition entitled “Mga Kulay ng Kalayaan (The Colors of Freedom)” showcases never before published photographs as well as news clippings and other memorabilia detailing the rich tradition of the Philippines’ most enduring political party. Senate Majority Floor Leader Francis “Kiko” Pangilinan congratulated the committee on this historical masterpiece as it reminds the party of its grand history and inspires them to remember the traditions. “We are happy to be part of this project,” said Resident Representative Dr. Ronald Meinardus. “Democracy is founded on ideals and in order for a party to persevere it must be firmly rooted in them. This photo exhibit clearly shows the Liberal Party’s visions stem from those,” he concluded. “Mga Kulay ng Kalayaan” runs for one week and is open to the public. It will then move to other venues.